Sunday July 4th 1920 I was looking after my own affairs some. Rob & Cora doing some packing. Lorie with Hattie in the kitchen where she was getting dinner. I helped with the dishes and wrote a little. Slept awhile. Late in afternoon took a ride. Rob & Cora to town and finished packing. Otts to Dubuque today taking Mary Moss and her Mother with them. Monday July 5th 1920 It rained hard late in the night. Rob & Cora with The Sheldricks did not get started till ten oclock. We had dinner and Hattie prepared things to take down to Fannies. I slept awhile and gathered all my things ready to pack. We went down to Otts at 4.30. Had supper in the yard. came home early as it threatened rain. 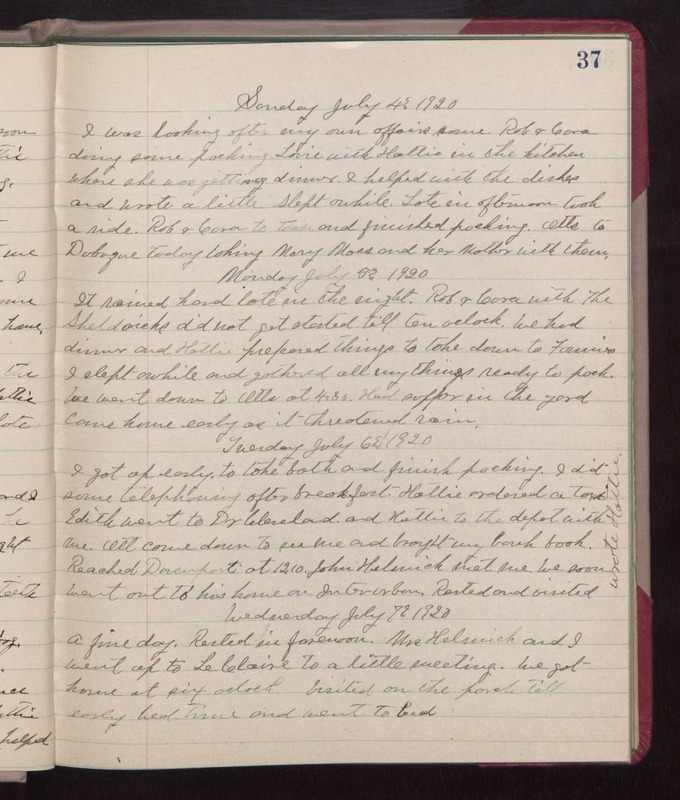 Tuesday July 6th 1920 I got up early to take bath and finish packing. I did some telephoning after breakfast. Hattie ordered a taxi. Edith went to Dr Cleveland and Hattie to the depot with me. Ott came down to see me and brought my bank book. Reached Davenport at 12.10. John Helmich met me. We soon went out to his house on Interurban. Rested and visited. wrote Hattie. Wednesday July 7th 1920 A fine day. Rested in forenoon. Mrs Helmich and I went up to LeClaire to a little meeting. We got home at six oclock. Visited on the porch till early bed-time and went to bed.